Coburn’s Acuity Plus easily handles a wide curve range, producing consistently excellent results via a one- or two-step lens fining process. Request more information about our lens finers & polishers today by calling 1-800-262-8761 or filling out this form. 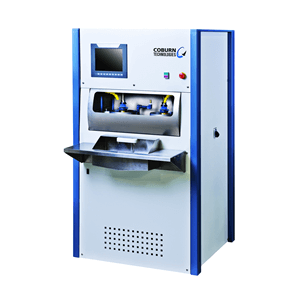 The new COBALT-DP lens polisher high speed soft-tool is part of the new Cobalt high-volume production system for free-form and traditional RX lenses. The Cobalt surfacing process leaves the final polished lens optically clear (virtually haze–free) without the need to apply hard coating for optical clarity and produces better surfacing (cut & polished) Free-Form lens results than any other free-form surfacing system in the industry. Automation is also available with the NEW Cobalt DP+. 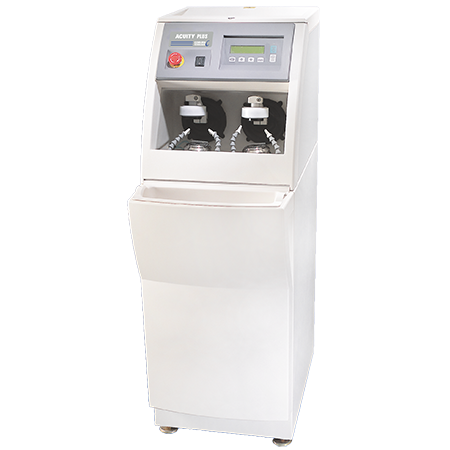 The Acuity Plus Polisher and Finer offers a number of options and user benefits, making it the most flexible cylinder polishing machine on the market. A sophisticated yet user-friendly and highly economical optical laboratory tool, it generates exceptionally accurate lenses by selecting the best lens processing times and pressures in accordance with the specified lens material: CR39, polycarbonate, hi-index or glass. This degree of precision is supported by a mechanical design providing optimized fining and polishing orbits.